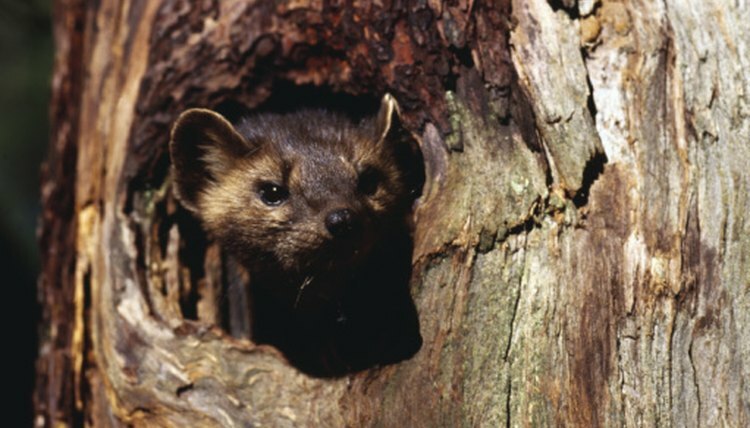 Michigan is home to a many North American mammals that have adapted to its forest environments and colder climate. Among these are the members of the Mustela, or weasel, family. Two distinct types of weasel that live in the state of Michigan are the ermine (Mustela erminea) and the least weasel (Mustela nivalis). Despite many similarities, there are some key differences between these two types of weasel. One of the first thing that distinguishes ermine from least weasels is the way each looks. Ermine have an average full-grown length between 6.69 and 12.99 inches and weigh between 0.88 and 4.08 ounces. The least weasel is generally smaller, with an average length of 6.5 to 8.07 inches and a weight between 1.06 and 1.94 ounces. Additionally, the fur colors for these two weasel types are slightly different. While both species sport white fur during the winter months, the tip of the tail turns black for ermine. During the summer, both types of weasel are a chocolate brown color, though the fur on an ermine's belly turns a yellowish-brown while the fur on the belly of the least weasel turns white with brown spots. Ermine and lesser weasels have many differences when it comes to reproduction. Pregnancy occurs for a whopping 280 days with the ermine, with a possible litter size of 3-18 offspring. For the least weasel, females are typically pregnant for only 34-37 days, giving birth to a litter of one to seven offspring. Despite these differences, both ermine and lesser weasel mothers care for their young (which are born blind and defenseless) until relative maturity. Because of differences in the average size of ermine and least weasels, both have different predators to contend with. Ermine worry mostly about large carnivores like foxes, fishers, badgers, and sometimes even domestic cats. Least weasels, on the other hand, are most often attacked by birds of prey like owls and hawks. Still, both of these weasel types can sometimes be attacked by the common predators of the other, depending on food availability and exact location within the state of Michigan. Because both ermine and least weasels can become a problem for farmers, particularly when they begin hunting domesticated fowl, trapping and killing these weasels has occupied farmers for centuries. However, ermine are also hunted for their fur, as they tend to have a particularly soft and luxurious winter coat. Ermine pelts are used to trim coats and make stoles. The furs of least weasels, on the other hand, do not have the same appearance or appeal.